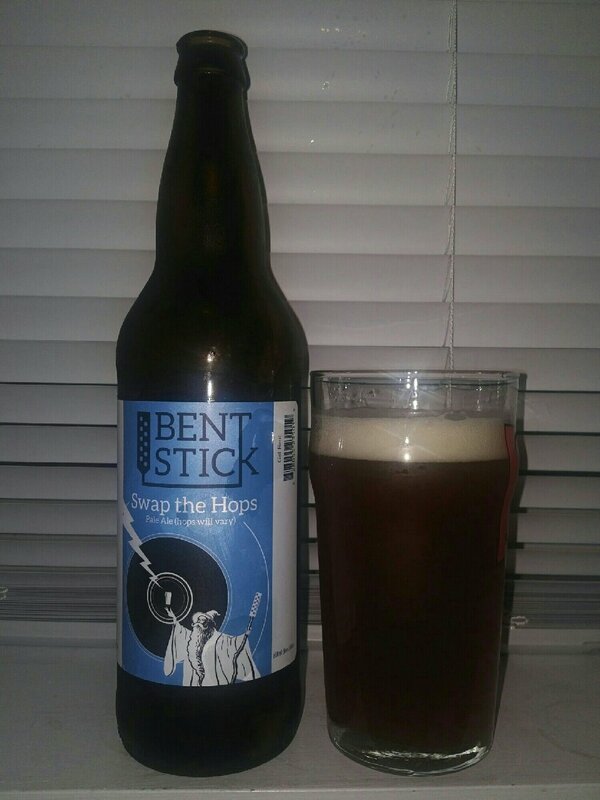 From the newest brewery in Edmonton Alberta comes their “Swap the Hops Pale Ale” a beer that will have different hops brew to brew depending on what they have on hand. The beer pours a cloudy copper colour with an off white head. The aroma consists of fuity melons, pear bready malts and leafy hops. The flavour is of melon, citrus, pear, bready malts, earth, herbal, leafy and bitter hops. The alcohol content comes in at 5%. For a brand new brewery this is a sold beer and I look forward to trying our more of their beers in the future. This entry was posted in Pale Ale and tagged alberta, bent stick brewing, bitter, bitterness, bread, bready, citrus, craft beer, edmonton, fruit, fruity, herbal, hops, hops bitter, hops bitterness., leafy, melon, pear, swap the hops.